Even if your concealed carry firearm has a light on it, it is a great idea to have a flashlight with you—after all, you don’t want to have to pull out your handgun to find that object you dropped in the dark parking lot! I scoured Amazon for for key chain flashlights and bought numerous different ones. The least usable were the ones where you have to hold one end of the light and twist the other to turn it on or off, taking both hands. The next unsuitable type are the rectangular ones. They are about 1/4″ thick, but are about 2-1/4″ x 1″. This makes them far too big for most key chains, especially if your keys are in your pocket. The last group are a little thicker than the rectangular ones, triangular or oval in shape, and around 1″ at the widest, and around 1.5″ long. I tested a bunch of different models and found the amount of light they provide was close enough that there was no notable stand out. The best value of the lot was the 10 pack of Lumand. 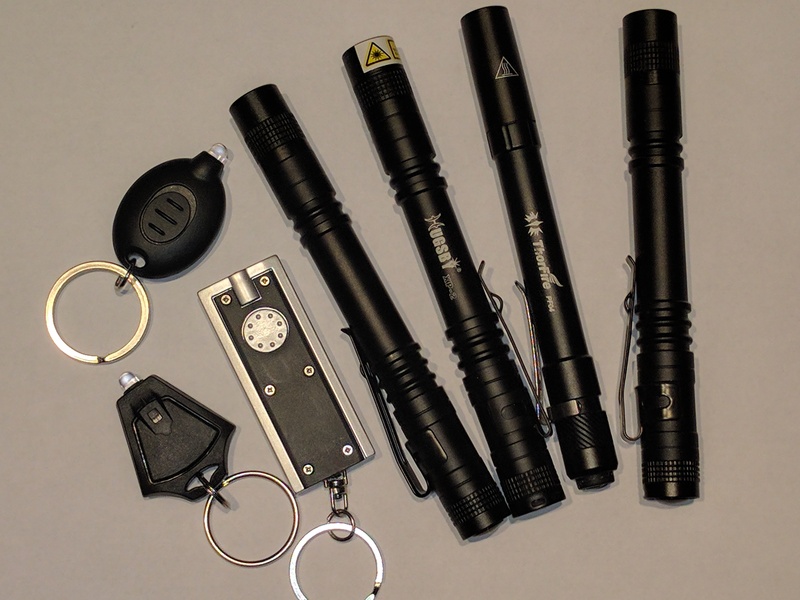 I also purchased a bunch of two AAA cell flashlights to find one that would make a good all around EDC light that wasn’t too big, but could provide much more light than the tiny key chain flashlights. I found that all the two AAA lights provided plenty of light, but only one model allows momentarily turning the light on by depressing the on/off button on the tail-cap—the Streamlight 66118 Stylus Pro. While it does command the highest price, the momentary feature is well worth it. If you’re looking for something even more compact, the Streamlight Stylus Pro has a one AAA cell little brother, the MicroStream. I prefer an EDC flashlight without multiple modes (hi/low/strobe/etc.) controlled by pressing the on/off switch multiple times to select the mode and the two Streamlight flashlights mentioned meet that requirement. If you do want those options, the Streamlight 88061 ProTac single AA cell is a great choice as it even allows you to program the light to various combinations of modes.